This update is an extra special treat for us, as it put us over the 10,000 public images mark. It is amazing to think we have this many images in our collection alone, and we are extremely grateful to Flickr for helping us continue to share our digitized images as we have for the past five years. You can drop by our Flickr photostream to view all our online collections to date. Happy viewing! Thanks for bearing with us on a tough week in the preservation world. As you have likely heard, all of the BAR appeals on Tuesday were overturned, which opens the door for demolition of the Kent and Piccadilly corner. No Certificate of Appropriateness will be issued for the next thirty days. The developer had also previously stated at the City Council work session no buildings would be demolished until plans were finalized. There is also a further appeal process open to PHW should we choose to exercise it. Above all else, we hope to have productive meetings with city staff both for this project and any others in the future that involve our irreplaceable architectural resources. Public input, consultation, and collaboration with stakeholders and residents should always be a priority, especially in regards to large scale projects the Historic District. We would like to thank councilors Willingham, Willey, McInturff, and McKannan for their position to retain the James Barr house at 206 N. Kent St., as well as McKannan for his support in seeing the historic value in the old Central Garage at 202 E. Piccadilly. 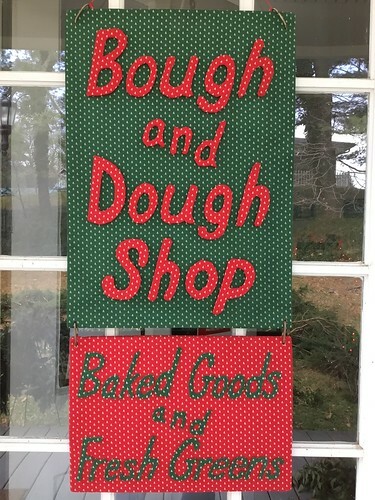 With the unpleasant business portion of our weekly recap complete, I would like to thank all the artisans who have filled in applications or expressed interest to the personal invitations to the Bough and Dough Shop. We are near our space limits for interior artisan setup as of this week. We are still open for a live greenery artist for after Thanksgiving to the end of the event, but all other slots appear filled or are in talks to be filled now. The applications will remain up on the website just a bit longer, and printed copies will remain available at the PHW office. New applicants will be retained on our call back list in case of last minute changes or spaces becoming available. Again, thank you all so much, and I hope we will have some fantastic new and unique items for our shoppers this year! 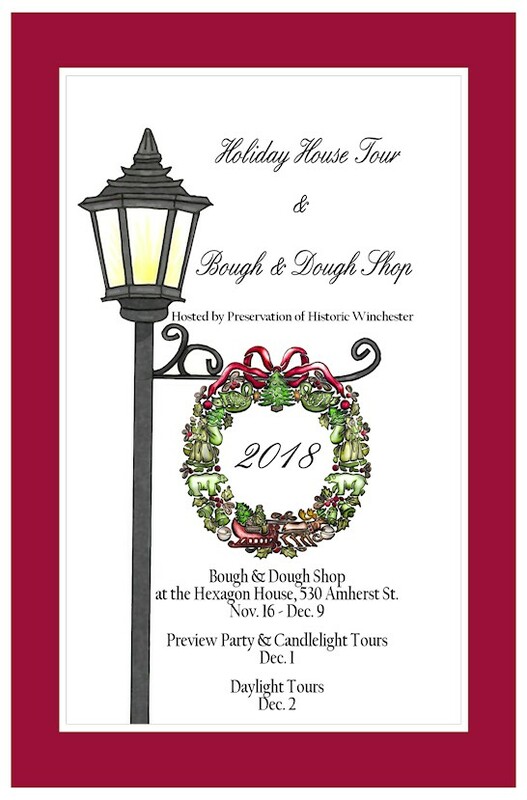 As you can imagine, we ran behind on getting our Holiday House Tour program booklet advertising material together, but the hard copy letters to past sponsors and those who have expressed interest are going out this week. If you would like to advertise your business, please get in touch and we will provide you the information. We are also very willing to help you design your ad or make sure it will work with our printer, so please feel free to contact us at phwinc.org@gmail.com for further information. The deadline for securing an advertising spot is October 31. Hurricane Preparedness: Are You Ready? We hope the worst of the storm passes us by, but we want to be prepared for the worst. Stay safe and dry, everyone! This week, we have something that is photo-adjacent from our collections – ephemera. PHW has been gifted a few odds and ends of papers over the years that don’t precisely fall into our main collection categories, but are still related in some way to our mission. A number of these seem to be papers found stashed in walls, under floorboards, or the like and given to us for safekeeping. You can get a glimpse back in time to the 1948 Apple Blossom parade with the program listing all the units and float sponsors. Be sure to zoom in on all four pages and see how many names and businesses you recognize! 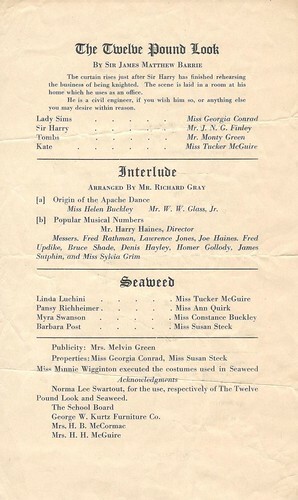 More curious is the handbill for what appears to have been an evening of entertainment and one act plays, perhaps held at the Conrad House around 1924. The first one act play, The Twelve Pound Look, was written in 1914 by J. M. Barrie and adapted as a silent film in 1920. The most succinct (if a bit spoilery) summary of the play can be found at Samuel French, or you can read the play in its entirely at the Internet Archive. The second play, Seaweed, has been a bit harder to track down, but it is likely the one by Alice Gerstenberg, written in 1924. Seaweed is on the obscure side these days, but it appears to have been a slice of life with four women speculating on their future while at a beach. It is likely PHW ended up with this handbill because of the Kurtz Furniture Co. acknowledgement, but a number of the actors are also familiar names to researchers. The playwright is also a notable figure in the Little Theatre Movement, particularly for children (tying back to our friends at Winchester Little Theatre). Be on the lookout in future weeks for more ephemera like these two pieces to join the Friday Photos lineup in the new Ephemera album on Flickr! This week, we have added 98 images of the Hexagon House from our Revolving Fund files to Flickr. Look back at the interior and exterior from about 1985-1991, including the fence installation, prep photos for the 1988 Holiday House Tour, the 25th Annual Meeting, and the placement of a marker in 1991. Enjoy them all at the top of the Flickr photostream. Also, don’t forget about the Alley Gallery unveiling tonight on August 3, 5:00-8:00 at 15 Indian Alley. You can see the oil pastel image of the Hexagon House painted by David Sipp that we shared last week in person to complete your Friday Photo viewing experience. If you missed the Winchester Star article covering the gallery opening, you can catch up online (login required). Happy Friday! We had a great time downtown on July 3, and we hope you had a great holiday, too. 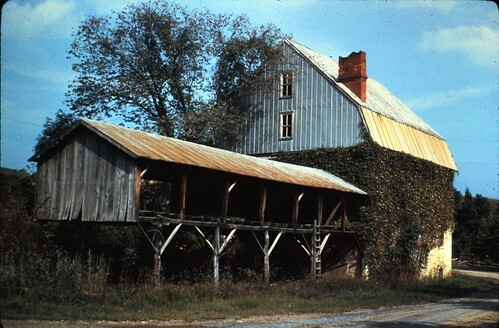 This week, we have twenty slides to share, including some sites in Frederick County, some Kurtz Cultural Center images, and a few stragglers for the Simon Lauck House. Catch them all at the top of the Flickr photostream! Since this is a bit of a quiet week, we also wanted to transcribe the article accompanying the oldest photo we are aware of for the Piccadilly and Kent Street intersection on the Central Garage. We believe the following article was written in late 1914 or 1915. That the wonderful development of the automobile will go down in history as one of the greatest wonders of this wonderful age, no thoughtful man can for a moment doubt. Every season improvements are being made and it would seem that perfection is not very far away, though many contend that the machine of the present is comparatively nothing to what the future will bring forth. 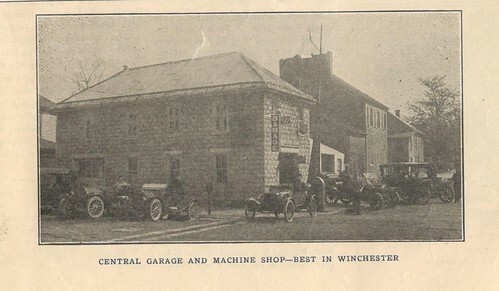 Winchester is one of the best automobile places in the country, when its size is considered. With the famous and historic Valley Turnpike and other fine roads leading to it from every direction, it is a favorite stopping place for tourists, between the North and South, and hundreds of machines owned by local people. One of the most popular garages in the city, and the only one that is steam heated, is the Central Garage and Machine Shop located at the corner of Kent and Piccadilly streets, opposite the B. & O. passenger station, of which Mr. H. B. Sell is the proprietor. There is ample storage room for a large number of cars. The repair department is by far the best equipped and most complete in Winchester. Only the most expert and skillful mechanics are employed, men who make a specialty of automobile work, and keep in touch with every advance that is made in automobile construction. Mr. Sell is himself and expert mechanist and gives his personal attention to all work entrusted to his care. His facilities for repairing and making broken parts are of the best, much better than are usually found in a small city. He also owns a number of cars which may be hired at reasonable rates. In addition to his automobile business he conducts a general machine shop and most of the large plants in this vicinity, such as the Virginia Woolen Mills and the Knitting Mills are among his patrons. There is no job too intricate or too difficult but that he is prepared to undertake and carry to a successful conclusion. Mr. Sell is a native of this section where he is well and favorably known. He has for years been identified with its business life and is always ready to aid in its upbuilding. Thank you all for your patience this morning as we got our website back on its feet. Before we get to the photos, be sure to get in your last minute preservation award nominations by 5 PM on Monday. Feel free to email them to phwinc.org@gmail.com. 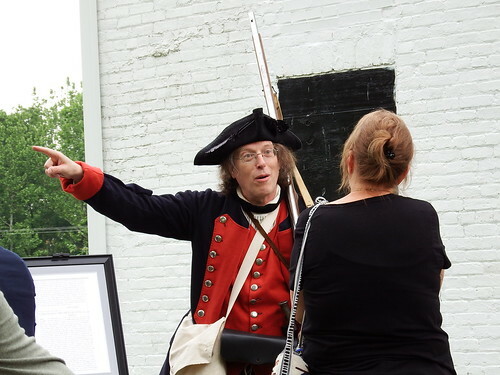 Last Saturday was double booked for us at PHW, with the third annual Clowser memorial service in the morning and the historic plaque walking tour make up date in the afternoon. The weather cooperated just enough for both events to be a success. You can catch the images from the event at the top of our Flickr photostream, or at the end of the 125 E. Clifford and Clowser House albums. Special thanks go out to Larry Webb and the Clowser Foundation for inviting PHW to their event; our walking tour guides Ed Acker, Frances Lowe, and Isata O’Dwyer; and home owners of 125 E. Clifford Street, Tom and Deanna Stouffer. Also, many thanks to Jim Shipp and Nancy Murphy, who confirmed our mystery building in the last photo batch was 619 South Braddock St.
We’re back and hoping for good weather! Please join us for the make-up walking tour to celebrate National Preservation Month on Saturday, June 2. 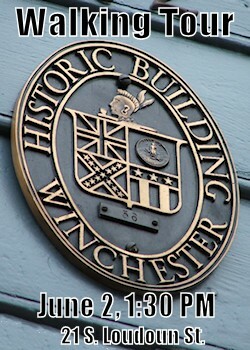 Meet in front of 21 South Loudoun Street at 1:30 PM, the first building to be marked with the oval plaque, to join a tour guide. We will go past the exteriors of homes in the Potato Hill neighborhood, with a small break for refreshments at 125 E. Clifford St., the latest home to receive the building plaque. 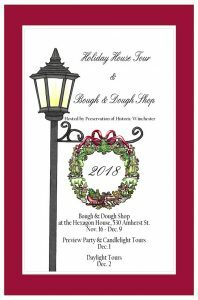 The tour will loop back to the edges of the Old Town Mall on Boscawen Street. The overall time is estimated to take one hour to an hour and a half. The tour is approximately one mile in length. Be sure to dress for the weather and wear comfortable walking shoes. Some of the sidewalks are uneven or narrow, and there are a few hills and one set of steps on the final leg of the tour. 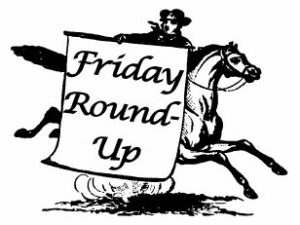 Friday Photos returns this week with 26 slides, most featuring the Simon Lauck House or 401-403 S. Kent, with a few other events and houses tossed in. Catch all of the photos at the top of the photostream. 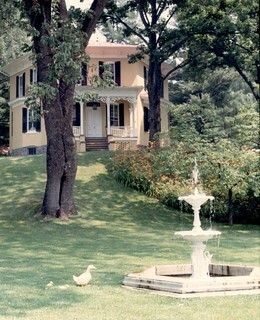 One photo location is unidentified; if you recognize this house, please let us know! Looking for some extra reading this weekend? Here are some assorted links we’ve bookmarked with interesting historic tidbits to pique your curiosity. PHW will be closed on Monday for Memorial Day. We’ll be back to usual on Tuesday. Have a safe and happy holiday weekend! From the Library of Virginia, researchers can now access Warren County chancery records online. Read the article at their blog Out of the Box. 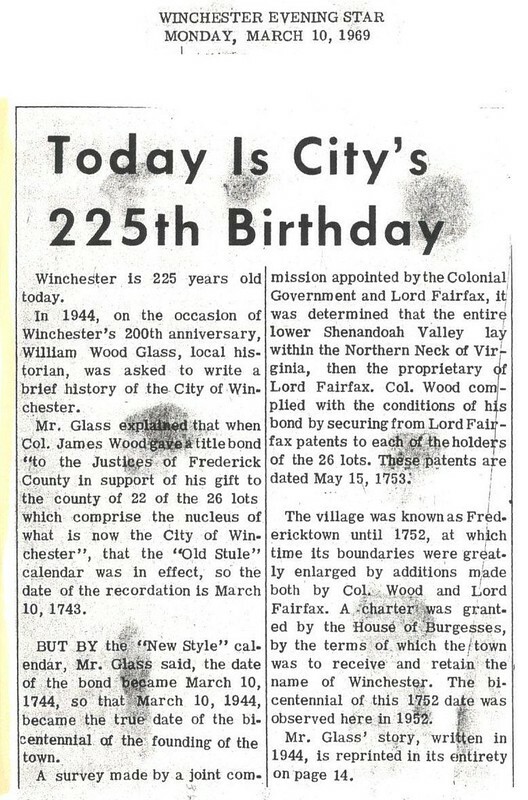 Winchester City records primarily 1859-1936 and Frederick County records primarily 1860-1912 are available for online researchers already. Chancery cases often list out real estate, furnishings, extended family members, and more specific and unexpected things like bills for sidewalk improvements or exact dates when advertisements ran in local newspapers. Chancery records can be very useful to flesh out the history of individuals you may be researching. 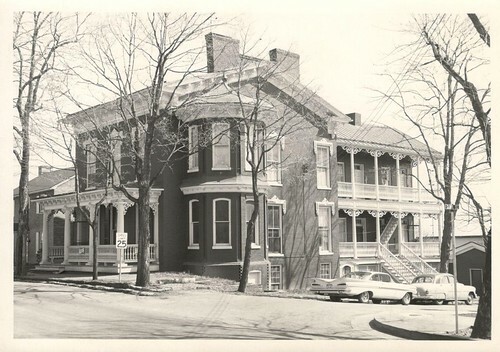 Friday Photos this week returns with 32 images from the Revolving Fund cabinet of North Loudoun Street. 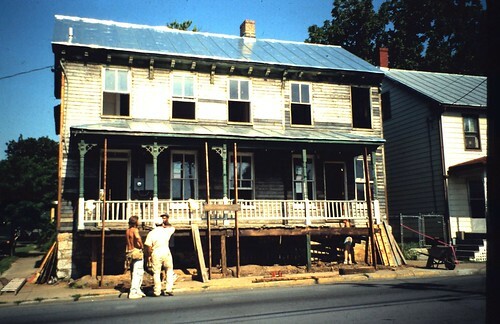 We found a few more images of the Hunstberry Building at 157 N. Loudoun, the Lewis Barley House at 327 N. Loudoun, and the Magill-Keller House at 418 N. Loudoun, including some pretty dry (but necessary) documentary photos of a sidewalk replacement. Catch all of them at the top of the photostream!